How coud I forget that I’d already started with this goal before we have officially started with the PDZ? But I guess that doesn’t really matter, since I’m still doing it. I’ve started in June, and I’m planning to do it for a year or so. I work at the hospital in our city. It’s my dream to become a doctor and that’s why I’ve chosen for a hospital to work in, to gain experience and also because I might have a higher chance to pass into med school this way. 😀 I work there every Sunday morning, which means I have to get up at 8.00 am!! Luckily I’ve still got the Saturdays to lie-in. It’s not hard work that I’m doing; I just bring the patients to an auditorium, which is used as a church, and after the mass I bring them back to their rooms. I also clean up the room beside the auditorium and set out the cups for the volunteers and patients who want to drink a cup of tea or coffee afterwards. After 11.15 I’m usually ready and all set to go home and have some breakfast with my family. Now I have more time, because the holiday has started, and I’ve chosen to also work in the hospital on Friday. Of course there isn’t a mass on Friday, but then I help with some other activities for the patients, which are good for them to stimulate their brain function and it’s just good for them to go out their rooms for some times; We don’t want them to be isolated! Working on the Fridays is much different than on the Sundays, because I have then more interaction with the patient. And of course I’ll let you see a picture of my badge. No photo of me, not even my name is on it. 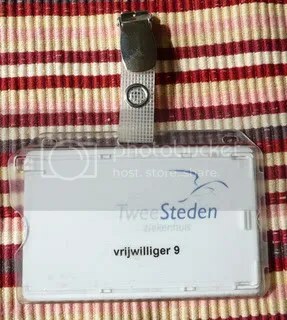 It just says: volunteer 9. But I don’t really care about that, I’m still proud of it. End date: april 16 2012.